Glenn Beck: Nation "under assault" by "anti-capitalist extremists"
Referencing the "Occupy Wall Street" protesters who have been demonstrating for weeks across the country, Glenn Beck said Saturday that "we are under assault not just from Muslim extremists outside of our country but anti-capitalist extremists." 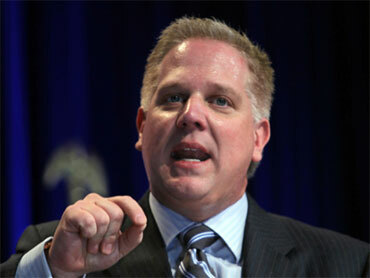 Speaking at the conservative Values Voter Summit in Washington, Beck said the "Occupy" protesters largely "just want the free stuff." Beck said that while plenty of people in the United States are unemployed and suffering, "there are many in this country that I call the 'funemployed,' who have no intention of getting a job." The "occupy" protesters have a variety of grievances and goals but are largely in protest of corporate greed and corruption on Wall Street and Washington. Beck, however, said they amount to "flash mobs that just gather together to take, to destroy." He said "there is a storm coming... a storm of biblical proportions" and that the U.S. is currently embroiled in a "race war" led by groups like the Black Panthers. He said the "war on terror is a religious war" and that there's also a "war between the media and the truth" - a line that won him a standing ovation. Beck said he predicted two years ago that the "violent left" would take to the streets. Still, he said the current turmoil has left the U.S. at "an amazing crossroads." "What's happening to our country right now is not a curse, it's a blessing," he said, explaining that there's an opportunity for Americans to renew their sense of personal responsibility. For instance, he said, "you go to school, you rack up a lot of school loans - that was your choice." He encouraged those who can't afford student loans to go to the public library. "By doing the small and simple things, by accepting the responsibilities that make each of us good, it will in turn make America great again," he said. "It will again define American exceptionalism for anyone in this city who may need a refresher on that."